Kyle Henry Erovre Okposo (born April 16, 1988) is an American professional ice hockey right winger, and alternate captain for the Buffalo Sabres of the National Hockey League (NHL). He was drafted seventh overall in the 2006 NHL Entry Draft by the New York Islanders, for whom he played from 2008 to 2016. Okposo played one season in the United States Hockey League (USHL) with the Des Moines Buccaneers in which he was named the most valuable player of the USHL playoffs and the league's top rookie. He helped the Buccaneers to a Clark Cup victory. During his freshman season at University of Minnesota, Okposo was placed at the center position, even though he is a natural winger. Throughout most of the season this became his most common position due to the abundance of wingers on the team. In January 2007, he played for the U.S. National Junior Team in the 2007 IIHF World Junior Championship. On June 7, 2007, Okposo announced he would be returning to the University of Minnesota for the 2007–08 season. Okposo played the 2007–08 season for the University of Minnesota ice hockey team until December 19, 2007. On that morning Okposo notified his teammates at the university of his decision to leave the team. Soon after, both the Gophers and the New York Islanders announced officially that Okposo decided to leave college after the completion of his current semester and would then begin his professional hockey career. Okposo's decision to leave school was considered controversial by some. As a response to questioning, Islanders general manager Garth Snow told the Minneapolis Star-Tribune, "Quite frankly, we weren't happy with the program. They have a responsibility to coach, to make Kyle a better player, and they were not doing that." Coach Don Lucia then claimed that the Islanders put him "in a very difficult position." In his response to Snow's comments, Lucia emphasized the importance of obtaining a degree, "We have had numerous players sign and play in the NHL, but just as important many more move on to have successful careers after graduating from the University of Minnesota. We have always and will continue to work to ensure our players reach their potential on the ice and in the classroom." Okposo signed an entry-level contract with the Islanders and was assigned to their top minor league affiliate, the AHL's Bridgeport Sound Tigers. He made his NHL debut on March 18, 2008, against the Toronto Maple Leafs, and netted his first career NHL goal on March 21, 2008, against the New Jersey Devils, a game-winner scored on the powerplay against Martin Brodeur. He also scored in his final game of the season in a game against the New York Rangers. On September 17, 2009, Okposo suffered a mild concussion after a check to the head by Dion Phaneuf. He returned to the Islanders' lineup for their opening game on October 3, 2009. On May 25, 2011, he signed a five-year, $14 million contract with the New York Islanders. Okposo broke out in the 2013–14 season, shortly after a strong 2013 playoffs against the Pittsburgh Penguins. Playing on a line mostly with John Tavares and Thomas Vanek, Okposo scored 69 points in 71 games, leading the Islanders in points for the first and only time since Tavares joined the Islanders. He scored his 100th career goal on October 14, 2014 against the New York Rangers. On January 16, 2015, Okposo scored four goals against the Penguins, also being his first NHL hat trick. Okposo became an unrestricted free agent on July 1, 2016. Okposo was one of the most heavily sought free agents on the market. Okposo signed a seven-year, $42 million contract with the Buffalo Sabres shortly after the signing window opened that day. Okposo was born to Kome and Michelle Okposo. Okposo married his wife, Danielle, on July 28, 2012. Their first child was born on January 6, 2014, Their second was born in April 2016. In late March 2017, Okposo was hospitalized in the neurosurgical intensive care unit in Buffalo General Hospital and missed the remainder of the season. ^ "Harris: NHL's Islanders sign Okposo away from Minnesota". USA Today. January 2, 2008. Retrieved May 7, 2010. ^ "Okposo leaves Minnesota to sign with New York Islanders". USA Today. December 19, 2007. Retrieved May 7, 2010. ^ "Isles GM says Lucia's coaching hurt Okposo". Star Tribune. 2007-12-20. Retrieved 2008-01-02. ^ "Okposo's first a game winner over Devils". Newsday. 2008-03-21. Retrieved 2008-03-23. ^ "Okposo agrees to 5-year deal with Islanders". Yahoo!. 2011-05-25. Retrieved 2011-05-26. ^ "Kyle Okposo joining Buffalo". National Hockey League. 2016-07-01. Retrieved 2016-07-01. ^ Marcus, Steven (Nov 19, 2009). "Okposo returns home for a party with family, friends". Retrieved June 30, 2016. ^ Kreda, Allan (October 2014). 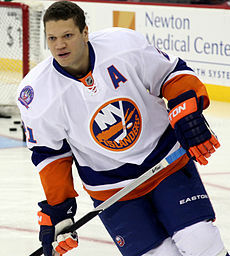 "Another Step Towards Stardom: Rising Star Kyle Okposo". Retrieved June 30, 2016. ^ "Danielle & Kyle". Retrieved October 22, 2014. ^ Rosen, Dan (January 6, 2014). "New dad Okposo misses Isles' game vs. Stars". Retrieved October 22, 2014. ^ "Okposo showing signs of improvement - Article - TSN". TSN. 7 April 2017. Retrieved 7 April 2017. This page was last edited on 7 April 2019, at 12:26 (UTC).